The Universal FT-7 Series is the foundation for FTX's entire remote start lineup. 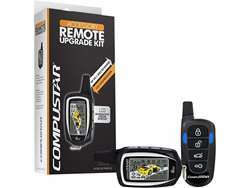 Universal remote start installs require a control module and bypass module (displayed). The Blade-AL is the FTX Preferred Choice for remote start integration. FT-7 Series Systems can be installed on all vehicle types: automatic, manual-transmission, diesel, luxury, and more vehicles. The AL-Series also features the FT-6300A-CONT Security System and the FT-7000AS-CONT Combo System.